What is an "INVERSE" video? Check out INVERSE part 1 for an explanation. The hand histories in this INVERSE video were submitted by a player from the ThePokerBank facebook page, just like the hands in SplitSuit's HH Review 1 video. All of the hands are from $4NL FR NLHE (the hands have been converted to show $100 stacks, but the hands were originally $4NL). As with all the INVERSE videos, there is no set theme here. 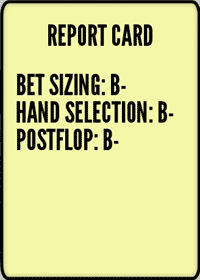 Instead, all of the hand histories replayed are from awkward spots that another online player wanted to have reviewed. Chances are that you'll find some of the plays and situations familiar, or hopefully that's going to be the case anyway. Final report card for INVERSE 4. (4:28) Hand 2 - Raising the UTG limper with KTo in the SB. T74r flop. (11:54) Hand 4 - BTN limps, Hero isolates with K4 in the BB. 7JKr flop and Hero checks. (16:32) Hand 5 - Open with AA in the CO. Get 3 callers (BTN, SB + BB). Flop is 673ss, SB min check-raises. (22:55) Hand 7 - UTG raises, Hero calls in the CO with 44, BTN and SB call. UTG bets on 228 flop and Hero raises. (27:28) Hand 8 - Isolating MP2 and CO limpers with AJo from the BTN. J63 flop vs 2 other players.